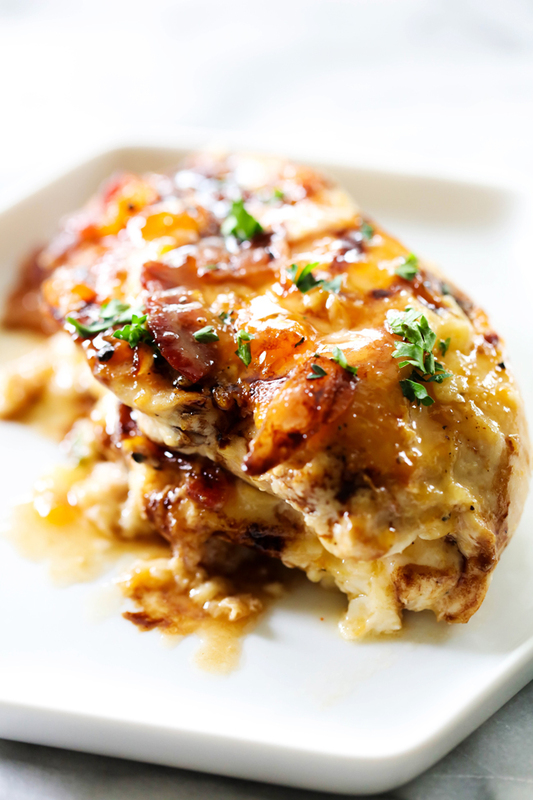 This Apricot Chicken with Brie Cheese and Bacon is such a tremendously flavorful dish. It is sweet, tangy, savory. Brie cheese, apricot, bacon and balsamic pair so well together. This will quickly become a new favorite! I am obsessed with flavor combinations and this recipe has so many that fuse together seamlessly. 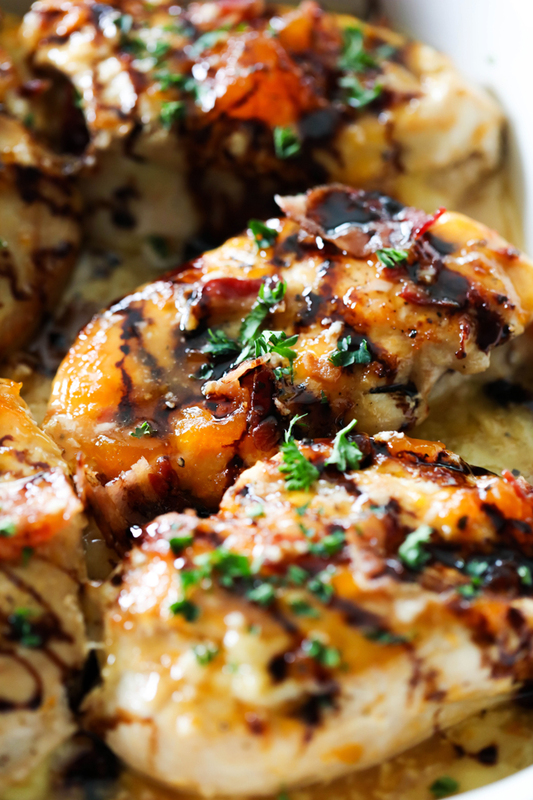 This Apricot Chicken with Brie Cheese and Bacon tastes sweet, tangy, and savory. This meal was a winner in my home. Brie Cheese is always a good decision in my book. It has such a great melt and taste. When it is paired with bacon something magical happens. The flavor is beyond words! This meal is fantastic! If you are looking for a recipe to add some bold and delicious flavor to your routine, give this one a try! Spray baking sheet with vegetable spray and set aside. Using a knife to cut a pocket into the side of each chicken breast. Salt and pepper the chicken on the inside and the outside. Heat a large skillet to medium high heat, Add olive oil and heat. Place chicken in hot pan and brown each side for 2 minutes. Remove chicken from the skillet and place in baking dish. Using tongs, carefully stuff chicken with the sliced Brie cheese. Layer cheese with ½ cup crumbled bacon, saving ¼ cup for the top of the chicken. Spoon apricot spread over the top of the chicken. Top with remaining bacon and bake for 35 to 40 minutes, or until chicken is done. 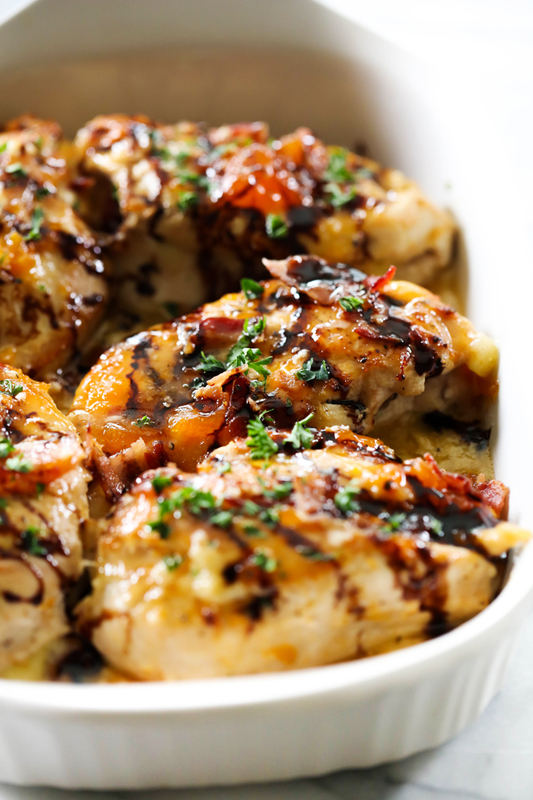 Drizzle chicken with reduced balsamic and serve. Place balsamic vinegar in glass bowl. Microwave vinegar for 1 minute and stir. Repeat until balsamic begins to boil. Continue cooking for 30 second increments, stirring each time. Repeat until vinegar has thickened. So sorry about the confusion! I can't believe I left out that step. It has been added now. You cut a pocket into each side of the chicken. This looks AMAZING! What do you serve with it?